The FactsBook series has established itself as the best source of easily accessible and accurate facts about protein groups. Books in the series use an easy-to-follow format and are meticulously researched and compiled by experts in the field. 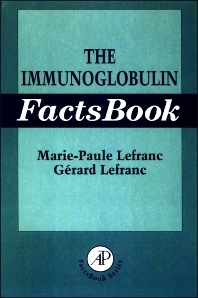 The Immunoglobulin FactsBook is the first published reference for all 203 human functional and ORF immunoglobulin genes. It is complete and standardized and employs nomenclature approved by the HUGO Nomenclature Committee. Research-level immunologists and those working in immunogenetics, genetics, cell biology, and biochemistry in academia and industry. Marie-Paule LeFranc nominated Senior member of the Institut Universitaire de France in August 2002.